Combat Pistol Range – Fort Pickett, VA - Curtis Contracting Inc. 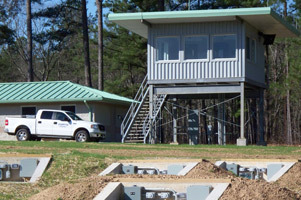 The project consists of a two story, structural steel observation tower, an operations/storage building, and the construction of a 15 lane, 105 emplacement combat pistol qualification course. The stationary infantry emplacements are fully automated and fiber-optically controlled by the observation tower.